Setting a sophisticated standard is easy with this beautiful decanter set. 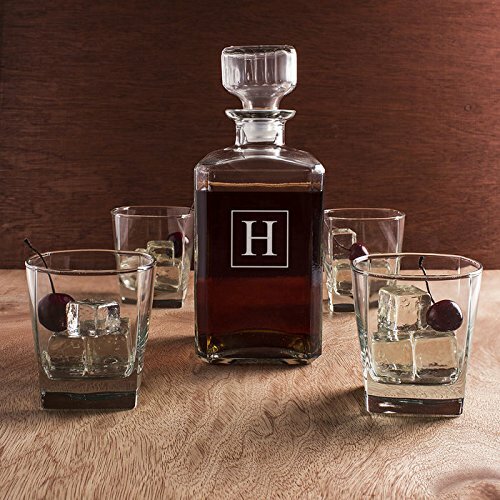 Coming with one Argos styled liquor decanter and four premium Rutherford whiskey glasses, this high-quality collection is the perfect addition to any refined home bar. Each piece comes engraved with our classic Oakmont design that features the name and initial of your choice making it an impressive keepsake for any special occasions such as retirements or graduations. All pieces are crafted from premium glass and are dishwasher safe. Argos decanter holds up to 23 ounces and measures 10.75 x 5 . 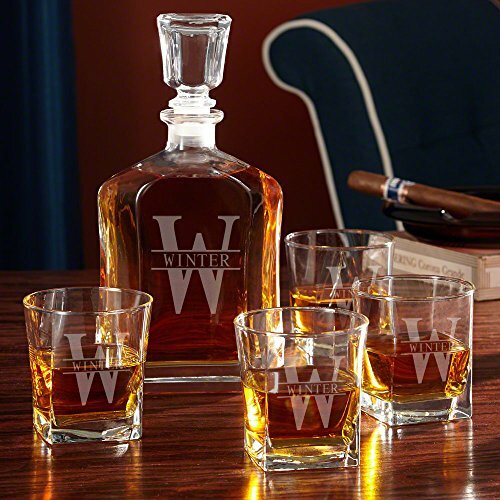 Rutherford whiskey glasses measure 3.5 tall and can hold 10 ounces of your favorite spirits..